Early one morning recently I woke up from a dream that had something to do with scrolling through Instagram on my phone and all I could think in that 'barely awake' state was that it's pretty amazing that someone was able to program a computer I carry around in my back pocket to recognize what I want to do based on where on the screen I touch. Not only that, but I can touch the a spot on the first page of apps and open one thing, then swipe to the second page of apps and touch the same place to open something different entirely. Who thought of that? And who figured out how to make it work? Computers mystify me. I have no clue how they actually work or how to change what they can do and I'm grateful that other people have been able to create ways for me to work with computers without needing to know everything about their inner workings. The same is true in a lot of other categories as well. I don't create new recipes, but I love following ones that other people create. I wouldn't know how to design a washing machine or a dishwasher, but I'm extremely grateful to the people who created them! Throughout history, people have created so many amazing things, in so many different fields, that it's kind of mind boggling. Genesis 1:26 says, "Then God said, “Let us make human beings in our image, to be like us." The 'in our image' part doesn't mean that we look like God, since He doesn't have a physical body for us to resemble. It's talking about His character. We are meant to be like Him in our character. Unfortunately, sin often gets in the way of that. We don't always express love and compassion, kindness, generosity and faithfulness as He does because our sinful nature is too selfish. One expression of His character that we don't often think about imitating is His creativity, but it is a large part of who He is. Just think about the variety we see in flowers or in the animal kingdom, not to mention the huge variety of appearances and personalities among people. God created all of it and designed it all to work together flawlessly. A lot of people protest that they're not creative at all, but I don't think that's true. 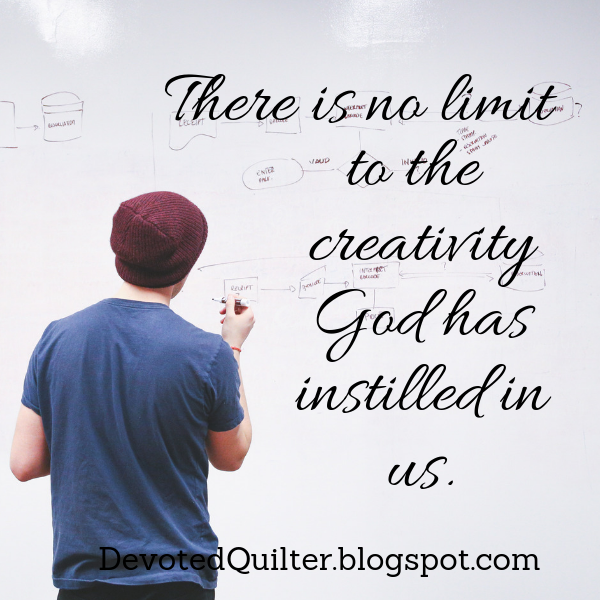 Creativity doesn't have to be painting or writing books or designing quilts. One friend talks about her mother, who can go to almost bare cupboards and somehow still create a delicious meal. Other people think of ways to teach children who are having trouble understanding a lesson at school or they come up with ways to raise money to help a charity they believe in. Still others design apps and computer programs that do things never thought of before. There is no limit to the ways people can be creative, because there is no limit to the creativity God has instilled in us. How are you creative most often? Another inspiring post, Leanne. So encouraging. I most often donate quilts or quilt blocks to charities and causes, like the CA fires and the hurricane efforts and your nursing home that burned effort . Girls' pillowcase dresses and donating to local stores ($1.00 or a toy, whatever they request) is also another great way to help. Happy New Year to you, too. Ooo! Yes! I couldn't agree more. Created in the image of a creative God - why wouldn't we have a deep need to express creativity? And as you say creativity can take many forms.